Felicia appeared on Show 310, recorded in Aspen, CO, on July 12, 2015, at age 12. 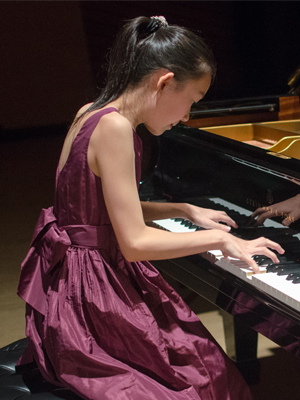 Felicia He, piano, 12, is from Saddle River, New Jersey, and currently studies with Yoheved Kaplinsky in the Juilliard School’s pre-college division. Felicia has been competing since age 5, and has performed at such staple venues as Alice Tully Hall at The Lincoln Center, Carnegie Hall in New York City, and Aspen Festival’s Harris Hall as a part of their Preconcert Overture series. In the summer of 2014, she appeared on AMP’s Performance Today, and that same year, performed in concert with the Fort Worth Symphony, conducted by John Giordano. Outside of music, she enjoys reading and being with her family.